A flexible spending account (FSA) is a benefit you sponsor for your employees. A flexible spending account lets your employees set aside pre-tax dollars to pay for eligible expenses like healthcare and/or dependent care, depending on plan type. Federal tax law allows employees to lower their tax burden by paying insurance premiums, unreimbursed medical, dental and vision expenses, and child and dependent care with before-tax dollars. Using these Flexible Spending Accounts and/or Premium-Conversion Plans, a Company can tailor a plan to meet its needs. As an administrator of these plans, RPG can advise which options are best for your company. 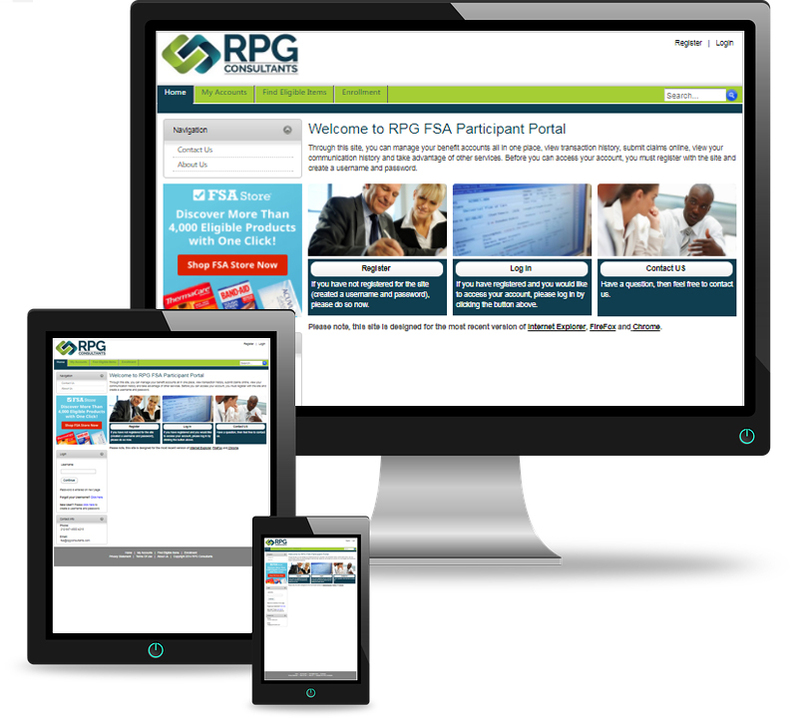 Once a client finalizes the company’s plan details, RPG will draft the plan document and customized communications materials to be distributed to employees at meetings. RPG will organize and provide all on going Plan administration including, but not limited to, the review and payment of claims via our web-based claims processing system with the ability to provide reimbursement by direct deposit. These plans offer benefits to Employers including higher employee retention rates and lower FICA and Medicare employer contributions. Cafeteria Plans allow employees to lower their tax burden by paying insurance premiums, unreimbursed medical, dental and vision expenses, and child and dependent care with before-tax dollars. This section is for those who are currently enrolled or are interested in participating in an FSA or HRA Plan. The following is an overview of eligible and ineligible expenses and qualifying dependents under a medical flexible spending/cafeteria plan. Please refer to IRS Publication 502 (below) for more information. Medicine, drugs, birth control pills, and vaccines for which a doctor’s prescription is required. Over-the-counter medication (if used to treat an illness or injury). Medical doctors, dentists, eye doctors, chiropractors, osteopaths, podiatrists, psychiatrists, psychologists, physical therapists, acupuncturists and psychoanalysts (medical care only). Medical examination, X-ray and laboratory service, insulin treatment, and whirlpool baths the doctor ordered. Nursing help. If you pay someone to do both nursing and housework, you can be reimbursed only for the cost of the nursing help. Hospital care (including meals and lodging), clinic costs, lab fees. Medical treatment at a center for drug addicts or alcoholics. Medical aids such as hearing aids (and batteries), false teeth, eyeglasses, contact lenses, braces, orthopedic shoes, crutches, wheelchairs, guide dogs and the cost of maintaining them. Expenses for which reimbursements are already available under another medical plan. Premiums paid for health coverage under any plan maintained by the Company or any other employer, or the basic cost of Medicare insurance (Medicare A). Advance deposits for services not yet rendered, such as the typical global fees for maternity or orthodontics. To be reimbursed, you must wait until the service is actually provided. The hospital insurance benefits tax withheld from your pay as part of the social security tax or paid as part of social security Self-employment tax. Nursing care for a healthy baby. Travel your doctor told you to take your rest or change. The expenses are incurred for services rendered after the date of your election and during the calendar year to which it applies. The expenses are incurred for the care of a dependent described above, or for related household services, and are incurred to enable you to be gainfully employed. If the expenses are incurred for services outside your household, they are incurred for the care of a dependent who is described in 2(A) above, or who regularly spends at least 8 hours per day in your household. If the expenses are incurred for services provided by a dependent care center (i.e., a facility that provides care for more than 6 individuals not residing at the facility), the center complies with all applicable state and local laws and regulations. If the expenses are incurred for services provided by a camp, the dependent does not stay overnight at the camp. The expenses are not paid or payable to a child of yours who is under age 19 at the end of the year in which the expenses are incurred, or to an individual for whom you or your spouse is entitled to a personal tax exemption as a dependent. $5,000 ($2,500 if you do not certify that (i) you will file a joint Federal income tax return for the year with your spouse or (ii) you are not married). Your taxable compensation (after the reduction agreed to for dependent care assistance). For purposes of (a) above, if you are married to another participant in the Plan and file a joint Federal income tax return, a single $5,000 limit applies to both you and your spouse. For purposes of (c) above, your spouse will be deemed to have earned income of $200 ($400 if you have two or more dependents described in paragraph 2 above), for each month in which your spouse is (i) physically or mentally incapable of caring for himself or herself, or (ii) a full-time student at an educational institution. For all purposes of this paragraph, certain separated spouses are not treated as married. Please refer to IRS Publication 503 for more information. Participants can use their benefits cards as they would use normal debit or credit cards for FSA eligible expenses. Most eligible expenses will automatically be approved and will require no submission of expense documentation. Most ineligible expenses will automatically be denied. The card works by interfacing with the Inventory Information Approval System, or IIAS, a point of sale technology in place at most major vendors who use credit card processing machines and sell any health related items. The system automatically vets most expenses. * Some uncoded expenses may require further documentation if requested by the FSA Dept.